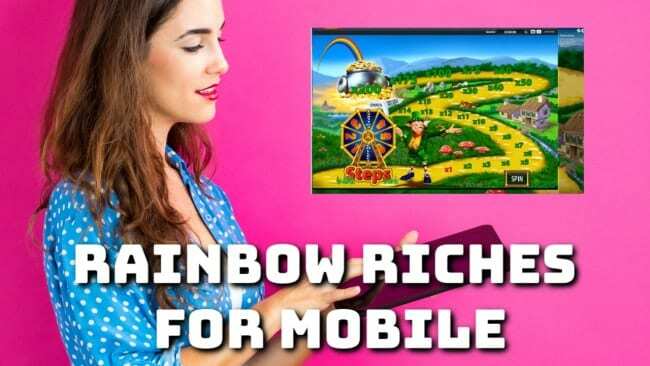 Avid fans of the Irish-themed slot game, are often searching for more access to the game and its features- thankfully there are plenty of ways to play Rainbow Riches, thanks to its app and other ways to play via a mobile phone. As online gaming grows in popularity, it seems that many in this day and age are looking to play from their device. It is no secret that the majority of customers now play slot games from their smart phone or tablet, and for that reason game websites need to keep their finger on the pulse. This means offering cutting-edge gameplay and chances to play from a phone. Read on to learn more about the game itself and the desirable features that it brandishes- as well as ways to play from your mobile phone for free. You can downlo ad the Rainbow Riches free-play app within seconds; it comes at no cost and enables you to play the game for free. If you are simply playing for the love of the game and not for the big wins, then you will love this opportunity to play from your phone. Although it is a great way to interact with the game and get to know the features a little better, we prefer the game that enables you to win real money. This can also be done for free, when you make use of the free promotions. Our problem with the free-play app is that it is packed full of adverts and interruptions, that is why we prefer the gameplay via other websites. You can download mobile phone apps for some of the big casino sites that feature the game and then load the game from there, this is a more enjoyable and uninterrupted way to play. Whether you want to play from the comfort of your home, or take the casino out and about with you, it can be done without stress. We live in a world where mobile technology is second to none, and that means access to our favourite slot games regardless of our location. 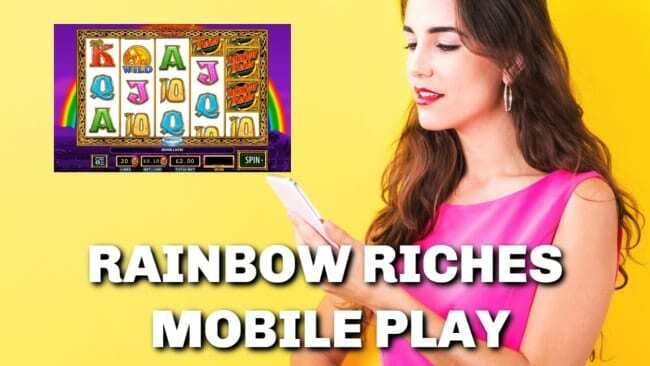 Play your favourite slot game with a Rainbow-Riches app- you can simply enjoy all that it has to offer during your commute or whilst waiting in a queue. Keep yourself occupied wherever you are, all you have to do is put in your headphones or place the game on silent whilst trying to land the bonus feature. As we mentioned above, we prefer the casino apps and then you can access this particular slot game from there, you will then be able to play via your mobile phone app. Believe it or not, you don’t even need a mobile phone app to play on the go. Many of the casino sites now transfer the html ultimately enabling you to play from the Internet browser on your phone. In other words, you can load up the Internet on your phone visit the website and play the game without the need of an app. Almost every website is now equipped to handle gameplay from a mobile phone, as its common practice. If you are used to playing from your computer and want to take it to your mobile phone or smart tablet- simply access it from your browser. As we have discussed there are two ways to play from your phone, either use the browser and let the website automatically adjust to your mobile phone or download an app for the casino. You can also use their free app that enables you to play without cost. Either way, there are plenty of methods to enjoy the game as it offers mobile phone compatibility. Rainbow-Riches is a fan-favourite and for good reason, it produces colourful graphics and continuously keeps players on their toes. It has a number of bonus features including a wishing well feature, pot of gold and road to riches. When you land three wishing well features on bonus lines you will be able to pick one and reveal a prize, the prize is relative to what you are staking. You can also land a pot of gold that will reveal a prize, but our favourite bonus feature is the road to riches. It is not like many other slot games and that is why it’s so exciting. You can land Rainbow-Riches symbols and activate the road to riches feature, you will then roll a dice to see if you can make it to the end of the rainbow to unlock the biggest treasure. It’s great to be able to bring the casino to you, wherever you are, you can play your favourite slot game with ease. It is simple and is often part of many websites and slot games; make the most of this casino game wherever you are, SG Interactive have ensured that their game is a fast, seamless and non disruptive experience. The immersive game has been made to perfection, offering all players the chance to play without interruption. 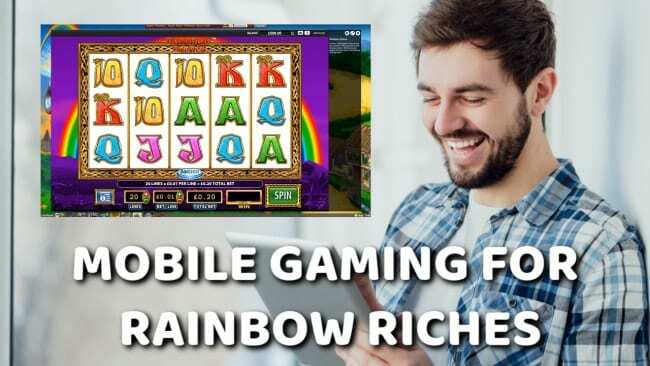 If you wish to play Rainbow Riches on mobile then you should first, check out new casino sites and ensure that you register for a bonus, therefore ensuring that you embrace free bonuses that let you trial the game without cost.